What is Speleology (or Cave Science)? A laboratory is often envisioned as an sterile place full of glass and metal, tubes and tables and one slightly eccentric looking gentleman. Caves and karst are about as far from this environment as one could imagine. The MSS is interested in science in which the researcher is just as likely to be lying in a pool of water, turning over rocks, and peering through a hand lens, muddy to her ears. Modern cave science, or speleology, is barely one hundred fifty years old, if you count the efforts of Adolf Schmidl in Slovenia and Edouard Martel all over Europe as marking its beginnings. Since its beginning, speleology has had a lot of mapmaking and surveying involved: you can't study something until you know where it is. Early speleology is not that much different than that of today: exploration, observation, formation of theories, and testing of those theories in the laboratory or the field. Granted, there is a bit more math these days, but that is the major difference. Speleology in the United States, at least that variety of theory based on rigorous observation and experiment by people with formal scientific training, is barely 70 years in the making. Many of the people who formulated the groundwork for groundwater hydrology, cave geology, speleobiology, and cave ecology are still quite lively, thank you. Others, while gone, still live in the memories of cavers who knew them as breathing human beings, not footnotes in some academic journal. The concept of a "professional speleologist"--someone making their living primarily from studying caves has not yet been realized. Most people lucky enough to interact with caves and get paid for it are primarily teachers, land managers, or have some other function related to their speleological interest. There is still much for the interested and educated amateur to discover and accomplish. What does this have to do with you? Just this. 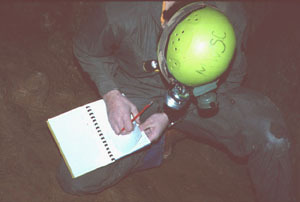 Science, and the promotion of cave research has always been one of the major goals of the Missouri Speleological Survey. Though our primary emphasis has always been on the discovery and mapping of new caves in the state, scientific research has never been far behind. Two of the three founders of the MSS have advanced degrees in scientific fields, and the third worked for a medical supply firm. Just knowing where and how long Missouri's caves are has never been quite enough. 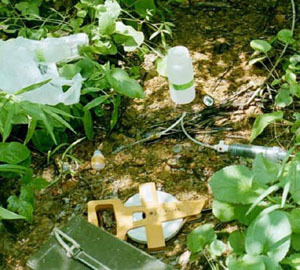 Discovering and documenting the geological and biological contents and processes which occur in Missouri caves has also been a priority item, from the very beginning. Through our Research Council, the MSS has been able to fund scientific efforts over the years. Research Council grants (Interest accumulated on our endowment which is entirely supported by donations) have never been huge sums of money compared to federal or philanthropic organizations. But often a few hundred dollars for instruments, or other supplies can make a big difference whether a bit of research gets accomplished, or not. These grants are available to MSS members or cooperators, after filing a request with the Council in a prescribed format. Sometimes, these grants also are given to graduate students, doing cave- related research in Missouri. In return, the MSS receives copies of the researchers' findings, and the right of first refusal to publish their findings in Missouri Speleology. Now that hard, scientifically verifiable data are the first line of defense in preserving Missouri's caves, scientific research is needed more than ever. And, though you need to present a legitimate field of inquiry, you needn't be a Ph.D. candidate to qualify for a little help. More information about proposal requirements for Research Council funds can be obtained from any MSS Officer.